A medium length hairstyle is the perfect way to achieve hair that is both easy to manage and very versatile. With a shoulder length or medium cut, you can try out plenty of different styles with your hair without having to deal with the extra work that comes with having ultra long hair. Medium length hair is perfect for many different styles. 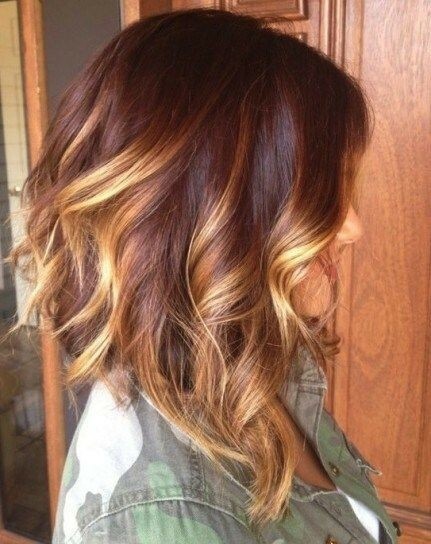 It is a great length for color because it is not too long or too short to participate in dip dyes or ombre trends. With medium hairstyles, you have just the right amount of hair to blend colors properly while achieving the full effect of the look. Ombre can be as subtle or contrasting as you wish. In this look, Amy McDonald has chosen to show off a more dramatic change as she distributes color from her dark roots to light blonde tips. Her shoulder length hair lets her make even this drastic transition subtle as it shows off many color tones. Layers work very well with medium length hair. You can use them to achieve more body in your style and more depth in your color. 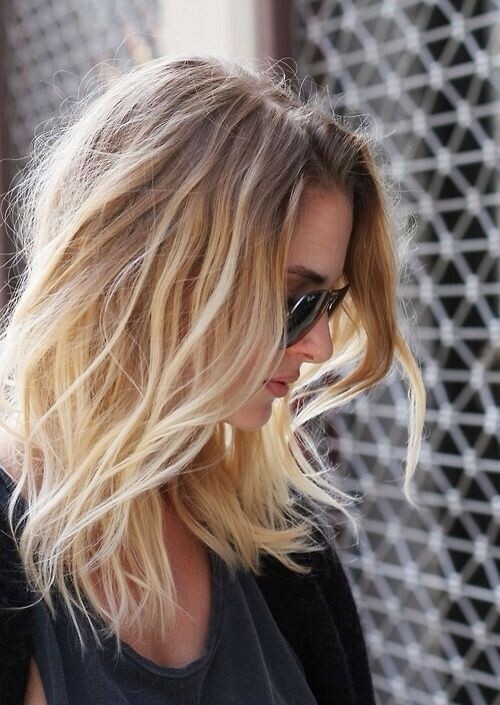 If you have thick hair, these layers will keep it light and manageable. 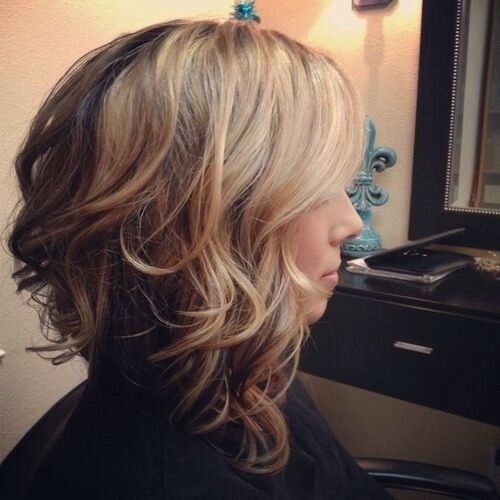 A wavy long bob is the perfect way to take advantage of your naturally wavy hair. When it is cut to a medium length, it has just enough wave to achieve a great amount of body for the hair. It is also great for framing your face. 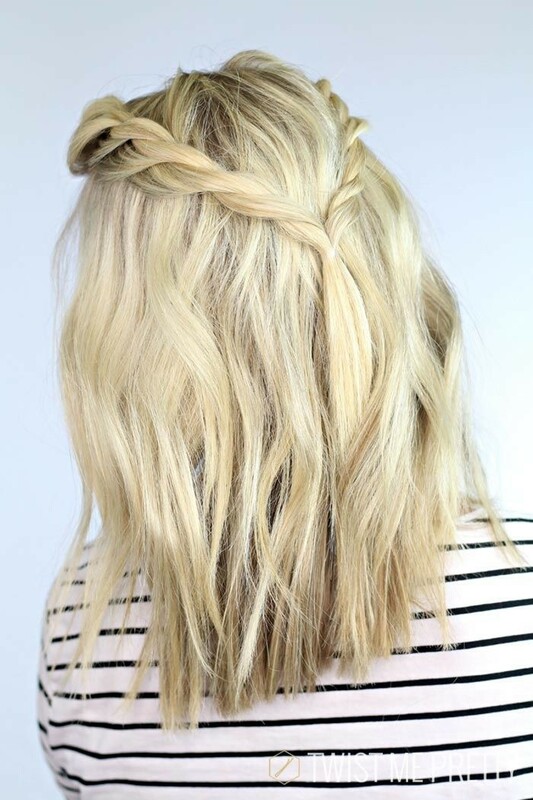 You can even layer your hair for a shaggy yet put-together look. Styling your hair with a simple braid is a great way to achieve a casual look while keeping your hair away from your face. 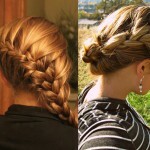 Simple braids look great with medium length hair because they are just the right length to look stylish and laid back. Braids are also a lovely way to accentuate all of the color tones in your hair. 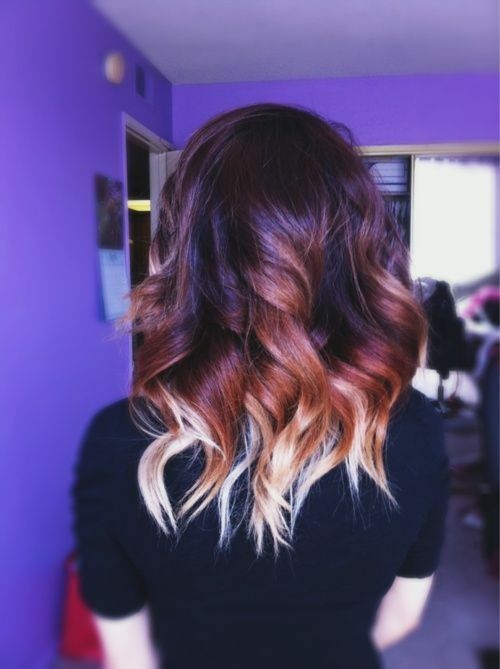 The ombre dip dye looks great on medium length hair. Medium hair is just the right length to achieve a long natural look while still providing enough length to have some fun with the ends. 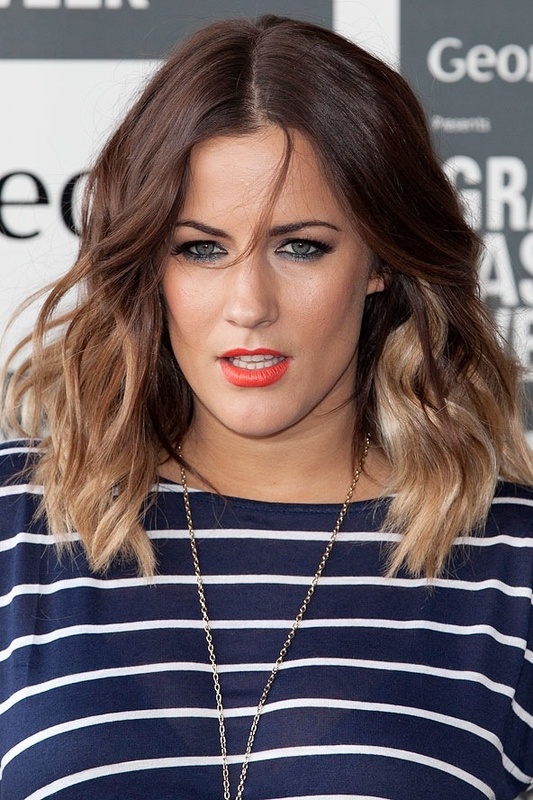 The ombre dip dye method allows you to achieve a more natural look than the bluntness of a traditional dip dye. Blunt bangs look natural with shoulder length hair. They avoid the contrasts that are achieved with long hair and also the sharpness that happens when your hair is very short. These bangs can be very casual and are a fun way to enjoy a simple yet quirky hairstyle. 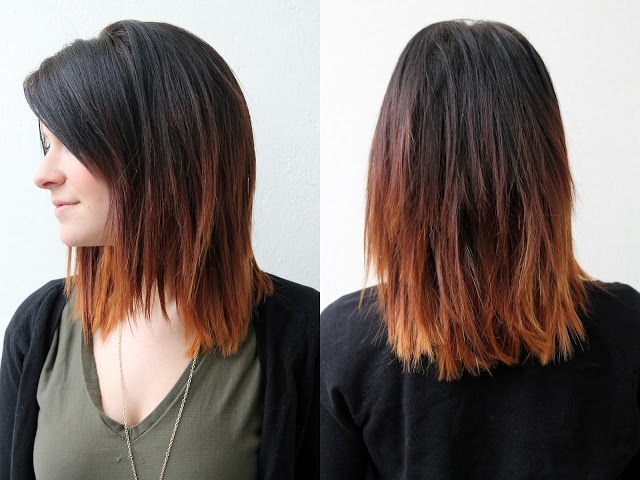 For a more dramatic look, check out a high contrast ombre. This ombre displays more dramatic tones than a more subtle ombre. 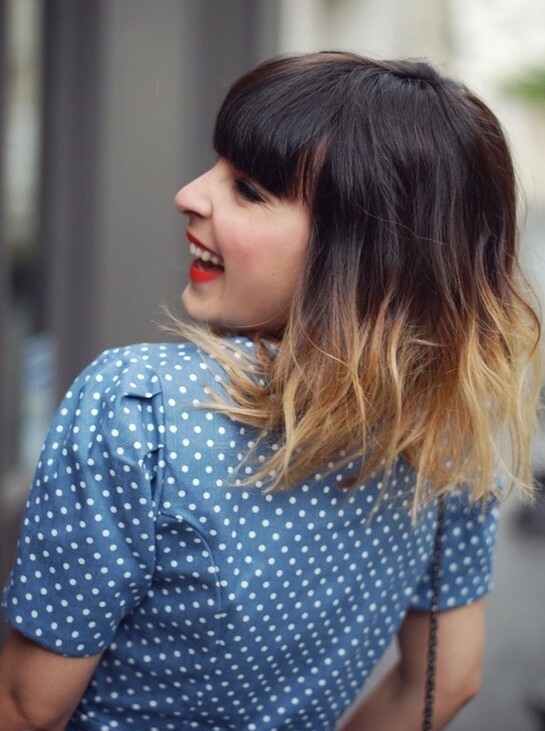 A high contrast ombre comes alive when it is styled with wavy, barrel curls. This lo-fi look shows off the many tones that a blonde look can achieve. It works well with medium length hair because it adds little variety into what is otherwise a traditional color choice. This is a bold look that incorporates two highlighting features all in one. The blunt bangs and the dip dye work together to accentuate your eyes. This look works well with a quirky, vintage look as well as a modern look. Curls and ombres go together like peanut butter and jelly. Curls are a great way to accentuate the pop of color that you achieve at the ends of your hair. It also draws attention to the lower half of your face and works great with a dramatic shade of lip color. This look brings Jennifer Aniston’s classic Rachel look out of the 90’s and into 2015. Copper tones are a pleasant deviation from last year’s bright reds. The soft color pairs well with a soft cut that frames your face. It may not be obvious that you can create an understated look with purple hair but if you choose the right tone it is very possible. This soft but daring look is paired with a slightly shorter than medium cut. 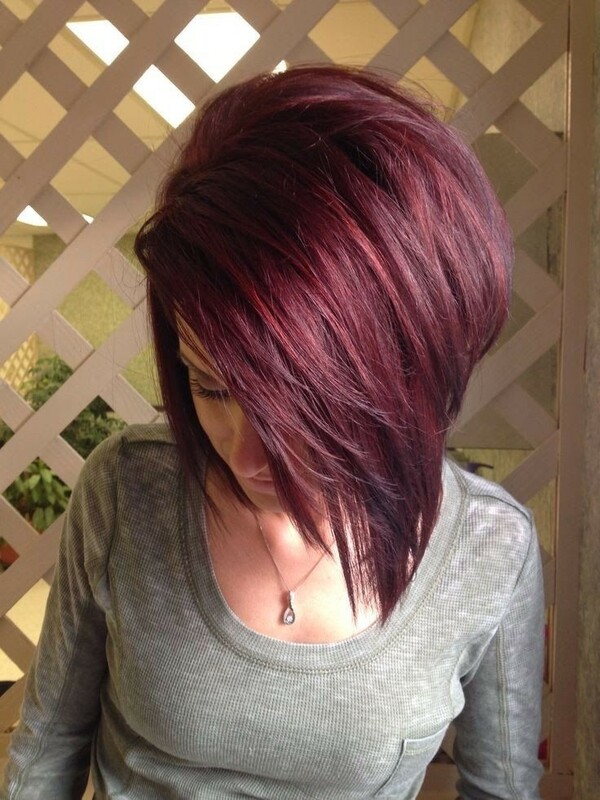 This another example of how you can pair your color with your cut to create a complimentary style. This color style is one that often fades away before making a dramatic comeback. Highlighting a blonde style with a dark brown undergrowth creates a full look even for hair that falls flat after styling. If you are lucky enough to have hair that holds, this kind of ombre is well paired with a little bit of body and some barrel curls. Taylor’s take on a classic blonde look is one to note. The neutral blonde style, the shoulder length hair and the soft bangs are reminiscent of someone who is making that transition from young adult to fully fledged woman. The look is a new classic one. You can easily envisage this look on both a modern woman and a classic movie star. These slightly blonde highlights work with dark hair tinted with red hues. The blonde highlights bring out all of the tones that the red has to offer. This is another example of a style that is both contrasting and complimentary. Like many contrasting styles, this style really shines when you show off all of the tones in your hair. The sharp angle cut also draws the eye to the highlights and the beautiful contrasts. Whether you have straight hair or curly hair, there is a right time in almost everyone’s life for a shoulder length cut. Medium styles are the perfect length to take advantage of the recent color trends. 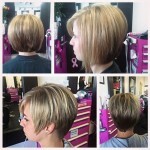 A shoulder length cut makes it easy to pair styles and colors. Whether you fancy an ombre or a dip dye, this hair length is just long enough to show off the all of the different colors you can achieve without over-exaggerating the differences.